Praises the CQC’s Andrea Sutcliffe’s `Mum’s Test’. “Social care faces a further £1bn of cuts this year, which will lead to fewer people getting care, a survey of directors has found. But almost half of those surveyed say that the cuts carried out over the last five years have had little or no impact on services. “More than £1bn will be cut from social care services for older and disabled people in England over the next year, leaving tens of thousands facing reduced help with basic tasks such as washing, dressing and eating, council care bosses have said. A former care minister has warned there isn’t enough money ‘down the back of the integration sofa’ to plug the social care funding gap as council bosses issue an urgent plea for the Government to protect services. “Social workers will have to cut the cost of service users’ care packages as councils reduce social care budgets by £1.1bn this year, according to research by the Association of Directors of Adult Social Services. “Local authority funding for social care services fell by nearly one-third over the last parliament, an analysis by the Association of Directors of Adult Social Services has found. More people are living longer with more complex needs that require vital care, support and protection from adult social care in councils. But this year (2015/16) councils are running out of ‘efficiencies’ and will make service reductions of £420 million to people needing that care and support and their carers. Additional funds are urgently needed to protect older and vulnerable people in the face of £1.1 billion budget cuts to adult social services, a report has warned. This follows "almost unendurable" cutbacks in the past four years and in real terms could mean people receiving fewer hours of vital home care or less funding for residential care, the Association of Directors of Adult Social Services (ADASS) said. It warned that some councils have made many of their savings in the past by freezing fees paid to providers, with some £32 million of efficiencies expected to be found through this route in 2016 alone. National deafblind charity Sense has today responded to the Association of Directors of Adult Social Services' (ADASS) annual budget survey. The report clearly states that without sustained and substantial additional funds, the current capacity for adult social care services will soon be ‘unsustainable’. Richard Kramer, Deputy Chief Executive, at Sense said, “The ADASS survey reveals that local authority budgets are under severe pressure from government spending cuts and increasing demand for services. This year, 2015/2016 councils are running out of 'efficiencies' and will make service reductions of £420 million to people needing vital care and support. ‘The ADASS Survey clearly shows that there is a crisis in the funding of Social Care and that local authority budgets are not keeping pace with increasing need. Care providers are struggling to sustain their services because very few authorities are funding the real costs of care. The Government's commitment to protecting the NHS will be worthless, without a proper funding settlement for Social Care’. ‘This survey once again highlights the mounting pressures on social care budgets. There is no hiding the fact that, despite the best efforts of local authorities, a sixth consecutive year of budget cuts will mean further reductions in services and fewer people receiving support. It defies demography that councils will spend £1 billion less this year on essential services that more of us will need. “This helpful report highlights the enormous pressures facing adult social care and emphasises the urgent need for adult social care funding to be put on a sustainable footing or care and support for the elderly and disabled will be at risk. 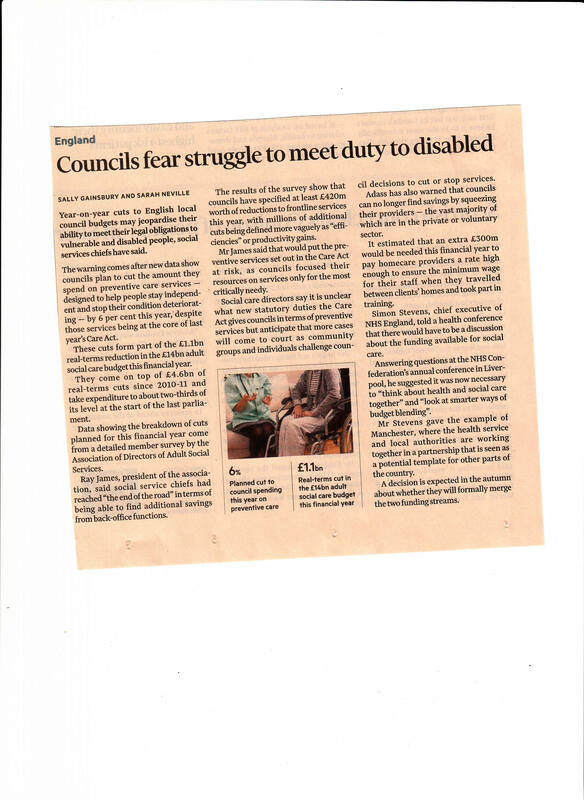 “Local authorities have sought to protect services for our most vulnerable people as far as possible, often at the expense of other services, and will continue to prioritise those most in need. However, the necessity for further budget savings worth £1.1 billion combined with other pressures of insufficient funding, growing demand and escalating costs mean that despite councils’ best efforts they are having to make tough decisions about the care services they can provide. This cannot continue. "The idea of a billion pounds coming out of social care budgets this year is chilling, given how patchy care quality already is. 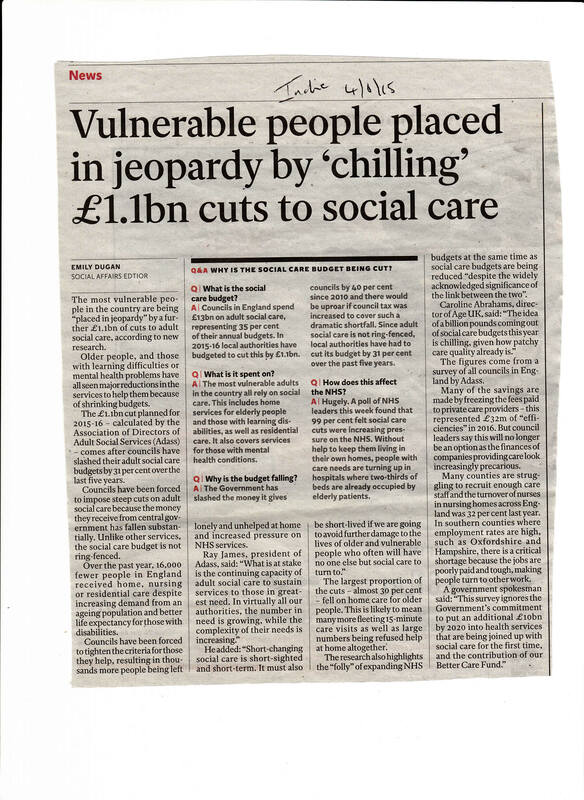 ADASS is not known for hyperbole so when they say further cuts would jeopardise the safety and wellbeing of vulnerable older people we should take that warning very seriously." "The service is already pared to the bone with hundreds of thousands of older people with a social care need unable to get any help. We are also hearing of growing numbers of care workers voting with their feet and taking better paid jobs in supermarkets, leading to staff shortages. "Unless Government acts to restore stability to social care funding there is now a real risk that provision could collapse in some places. That would be disastrous for older people and their families and pile further stress on our already hard pressed NHS." This survey ignores the government’s commitment to put an additional £10bn by 2020 into health services that are being joined up with social care for the first time, and the contribution of our Better Care Fund which is already focusing resources on helping people to live independently and improving care closer to home – worth £5.3billion this year alone. Freezing fees to care providers is directly causing the slow motion collapse of the care sector and somebody’s mum or dad or granny - our elderly and vulnerable – are the biggest victims.